Two changes are proposed for Route 10. Extend routing to serve Masonville Place from 9am to 2pm weekdays. Modify routing south of Southdale Road to operate on Wellington instead of Montgomery. 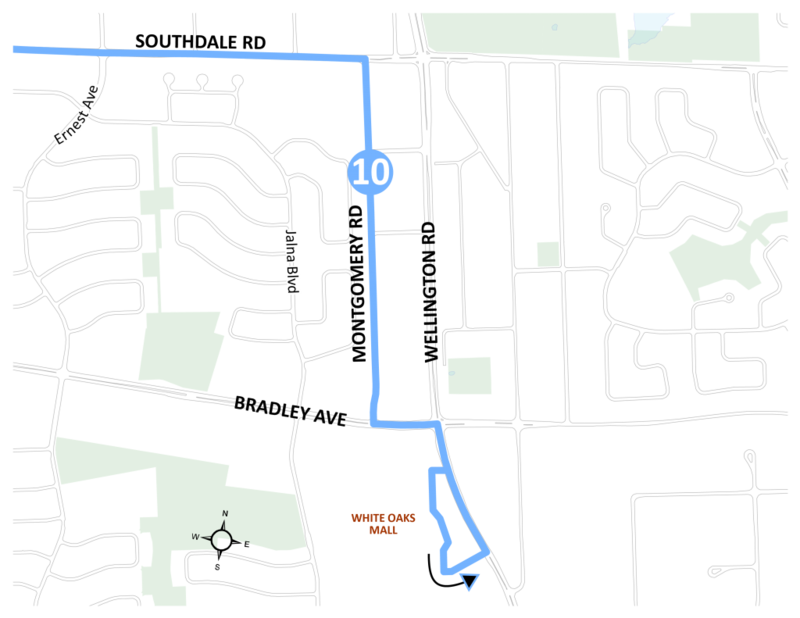 Route 10 currently operates to Masonville Place weekdays between 2pm and 10pm. The connection between Masonville and Western University is a high ridership, high productivity corridor that requires increased service on weekday mornings to match the ridership demand. Extending the hours of Route 10’s Masonville service also simplifies Route 10 by operating to the mall during mall hours throughout the week. In the south end, Route 10 currently operates on Montgomery, which is a parallel road to Wellington only 150 metres to the west. An opportunity exists to operate Route 10 on Wellington between Southdale and White Oaks Mall to improve transfer connections, make the route more direct, and improve passenger access to the commercial stretch on Wellington Road. Additionally, by removing stops on Montgomery, amenities such as shelters can be redistributed.